Everyday life hasn’t always been this way. What we do to get what we need—whether it is food, energy, or water—has changed drastically since our evolution into this world. From being merely stewards of our natural environment during our hunter-gatherer days, to using mechanical tools in the industrial age, to having fully automated systems today, it is clear what has brought us from every type of society to the next: technology. It has always been technological efficiency that has freed man from doing dangerous or tedious tasks. With the current state of technology, many tasks can be completed by automated machines alone. To potentially free us to do the things we value most in life, we should collaboratively adapt aquaponics farming, closed loop sustainable systems, and robotics so that no human is ever denied the basic necessity of food. With the utilization of technology, coupled with our emergent understanding of Mother Nature, there is no reason why world hunger can’t be a thing of the past. When people think of farming and agriculture, the common imagery is often a flat, country area with a barn, several acres of land devoted to planting crops, healthy soil, and lots of space for sunlight. Aquaponics requires none of that. It is a technology that utilizes our understanding of nature to allow the growth of plants without the need for sunlight or even soil. Instead, aquaponics requires only fish in a fish tank and plants in a grow bed. It uses the fish waste as nutrients for the plants, and, in return, the plants then clean the water for the fish. So, aquaponics is, in fact, a living ecosystem that can be built anywhere; and depending on the size, it can feed one, several, or hundreds of people without much work at all. One of the most useful features of an aquaponics system is its internal use of systems theory. Systems theory recognizes that there is no such thing as “garbage”; every output of one component is the input of another. Each component is connected together to form one synergistically connected system. That’s why the fish waste is used to feed the plants instead of just being cleaned out. The fish waste that is in the fish tank can then be pumped into a separate grow bed for the plants to take in through their roots. In effect, this cleans the water, which is pumped back into the fish tank so the fish have clean water to live in. This is a closed loop, sustainable system that continuously produces food forever, for free. While the aquaponics ecosystem is a great way to grow organic, free food all year round -without having to worry about such limitations as seasons, light exposure, soil, and drought- it’s still missing one important thing: modern technology, namely, robotics. Robotics can monitor and adjust pH levels in the water, maintain the water levels and temperature, and automatically turn on and off dedicated LED lights. By programming hardware that can monitor, maintain, and even self-correct the system itself, robotics can make the automated aquaponics system the method of farming that finally eradicates world hunger by creating abundance in food as well as eliminating the need for people to perpetually work for it. So, the question no longer has to be, “where does our food come from and who makes it?” We can start building our future cities to be self-maintaining garden cities that grow food everywhere, monitor shortages and surpluses, and are always adjusting themselves to do nothing less than make sure there is always food available to anyone and everyone when they need it. 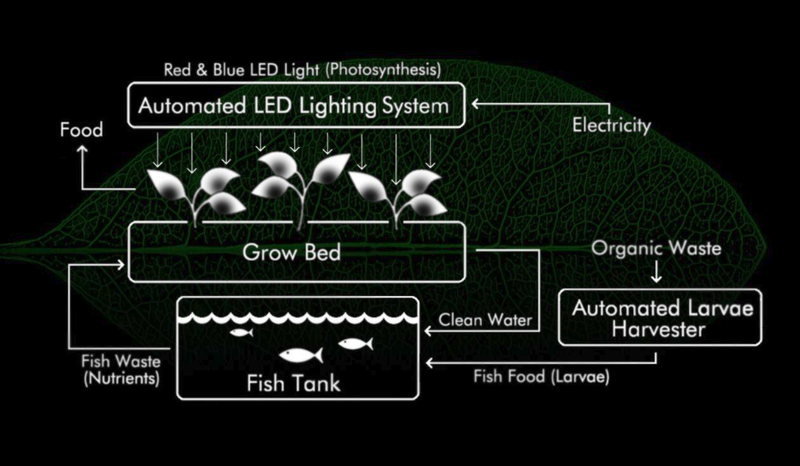 For more information on this method, please check out Open-Source Project Earth: Sustainable Food– a dynamic, automated aquaponics system. This is a fully open-source, DIY project that provides free access to all the necessary building materials, instructions, data, and research. Share this information, help others around the world, and let’s end this world hunger problem once and for all!